Chincoteague Island, Virginia - "Beautiful Land Across the Water"
Easter Decoy & Art Festival & Auction - This annual event includes approx. 100 wildlife artists and decoy carvers from various parts of the country. Annual Seafood Festival - For over 30 years this event has featured famous Chincoteague oysters, clams, fresh fish and more. An internationally well known event with attendants that often include members of the Senate, Virginia's Governor, and well known celebrities. Call (757) 336-6161 for more information. Annual International Migratory Bird Celebration - Event that recognizes the Eastern Shore of Virginia and its wetlands as a vital migration area for migratory birds along the Atlantic Coastal Flyway. Join birding tours by boat along the refuge and other environmental education programs at the visitor center. Call (757) 336-6122 for more information. The Blessing of the Fleet - An event to give blessings to protect the watermen from harm and ensure a good fishing season. Includes a water parade by local boats from the Town Dock to Curtis Merritt Harbor. Chincoteague Firemen's Carnival - Annual event with seafood, amusement rides, celebrities and entertainment. The event lasts for two weeks during July. Chincoteague Island Firemen's Carnival Fireworks - A spectacular fireworks display held by the Chincoteague Island Firemen. Annual July 4th event. Eat an oyster sandwich during the show by the bay. Chincoteague Blueberry Festival - Celebrate one of nature's tastiest and most healthy gifts: "Blueberries." Annual event with fresh blueberries and baked goods, ice cream and other delicacies featuring the blueberry. Crafts, arts, entertainment and more! Chincoteague Wild Pony Swim - Annual event that brings thousands of spectators who travel from all over the world to see the Virginia herd of approx. 150 Assateague Ponies swim across the Assateague Channel. Usually held on the last Wednesday in July. Wild Pony Auction - One of the highlighting events during Pony Penning. 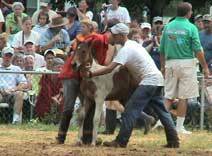 Ponies (yearlings or younger), owned by the Chincoteague Volunteer Fire Co., are sold on this day. Approx. 80 foals are sold each year. Usually held on the last Thursday in July. Chincoteague Decoy Carver's Assoc. Decoy Show in which local carvers display their fine art work. Call (410) 546-1635 for more information. National Wildlife Refuge Week Celebration - Auditorium programs, family activities, wildlife art shows and more. Usually held the first or second weekend in October. Contact Chincoteague National Wildlife Refuge at (757) 336-6122 to confirm dates. Annual Chincoteague Oyster Festival - Fresh oyster sandwiches, raw oysters, steamed oysters, fried oysters and more all you can eat. Held on Columbus Day Weekend. Chili & Chowder Cook Off sponsored by the Historic Main Street Merchants Assoc. Enjoy chili, chowder and other delicious food. Call (757) 336-3700 for more information. Assateague Island Waterfowl Week Celebration - A variety of things to do will be offered during the nine-day event. Runs through the Thanksgiving holiday. The Annual Deborah Waterfowl Show & Auction - Sponsored by the Chincoteague Chapter of the Deborah Hospital Foundation. Over 100 carvers and other artists will participate. Chincoteague Annual Christmas Parade - Annual holiday parade with fire engines, marching bands and floats from the Eastern Shore. Wildlife Cruise & Kayaking. Wild Ponies, Eagles & Dolphins.